This year’s Celebration of Life Members and Awardees was on June 19th. Please see below for our honorees! Allison M. Pyrch, PE, GE is a geotechnical engineer with Hart Crowser, Inc. who has been practicing locally for over 15 years. 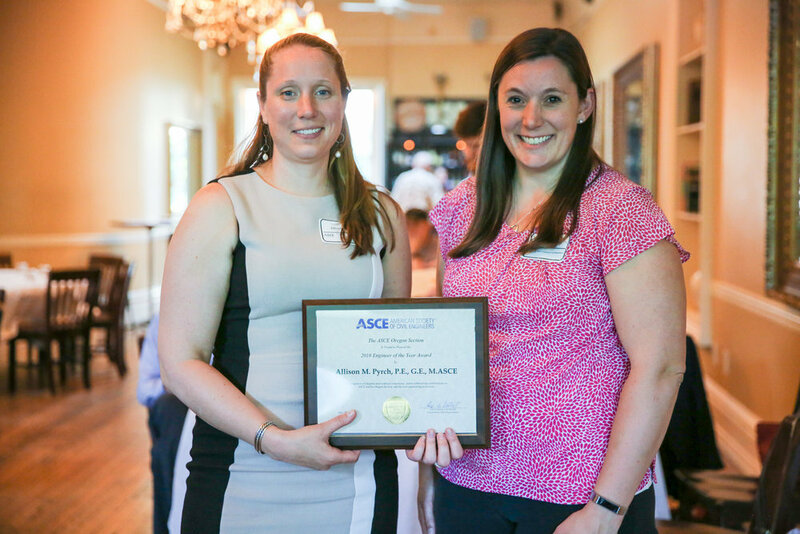 She has been an active member in the ASCE Oregon section since her time at Oregon State University. She has been on the section board since 2014 and has been leading the section’s resilience efforts since 2010 through her work with the Infrastructure Resilience Division. She has been an outstanding advocate for public works, engineering, and infrastructure resilience on local, state, and national fronts as well as to the public. 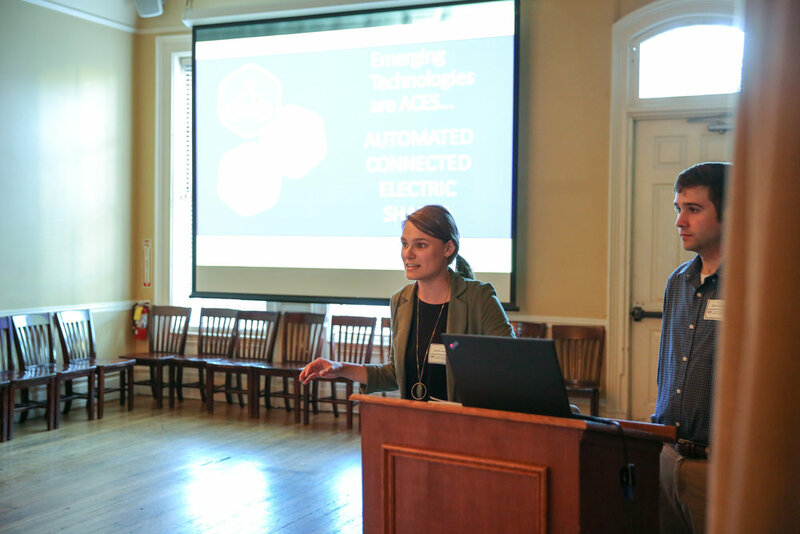 Since her debut as the organizer for the section’s 2014 Centennial Celebration, she has continued to serve the board with her energy and passion for civil engineering. Christopher A. Knight, EI spent most of his childhood in Klamath Falls, Oregon where he built structures out of any block, brick, stick, or pile of mud he could find. Graduating from Klamath Union High School, he specialized in upper-level math and science and in playing the trombone. He then went on to study Civil Engineering at Oregon State University, splitting his free time between the marching band and the student chapter of ASCE. Chris also helped paddle the concrete canoe to nationals and was a co-captain of the team the following year. Once graduated, he worked as a wedding photographer for a summer before taking a position at AKS Engineering and Forestry where he continues to work today. 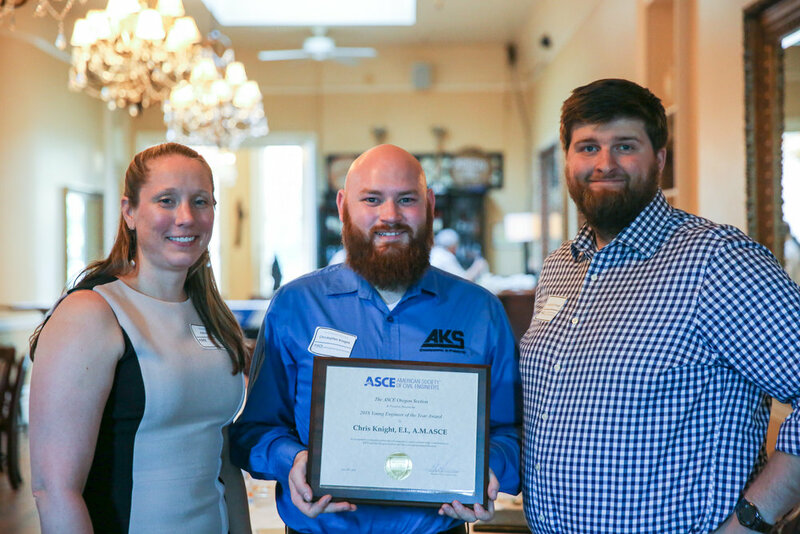 During the last four years, Chris has served as the Communications Chair of the ASCE Oregon YMF, was elected president elect, and is now the president of the YMF. He has been very helpful as a photographer at ASCE section functions and has been great support to both YMF and the section. Craig S. Dewey, PE, LEG retired in 2011 from a 25-year career at Western Federal Lands Highway Division of FHWA. In 25 years with the WFLHD, he worked in both geotechnical engineering and project management capacities on road improvement projects in the nation’s national parks and forests. Craig was a team member on 3 different FHWA National Highway Design Excellence Award Winning Projects. Craig joined ASCE in 1982 and has served on the board of the SW Washington Branch since 2013 and represents the SW Washington branch on the section board. 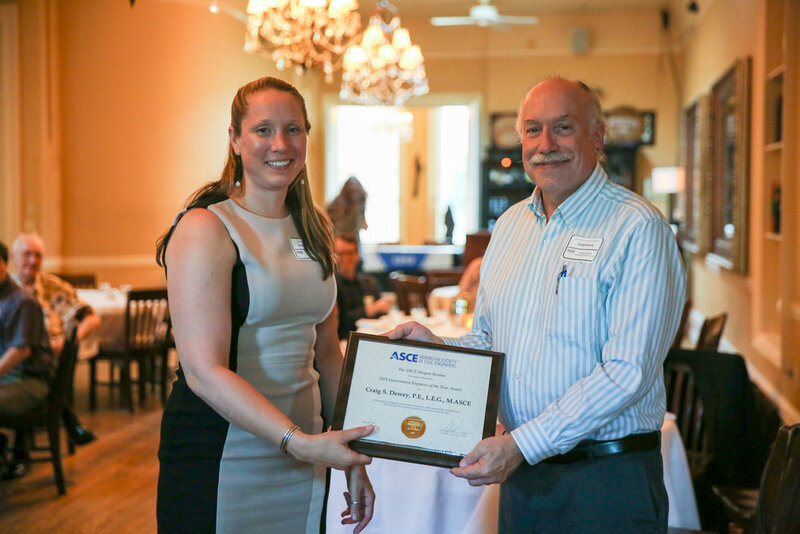 He has been a tireless leader for the branch and has kept ASCE active in SW Washington during his time on the board. In 2003 he was inducted into the Oregon State University Academy of Distinguished Engineers. Greg spent 30 years in the public sector as city engineer and public works director for the Oregon cities of Sandy, Newberg, and Gresham and retired 5 years ago after serving 14 years as the chief executive of the Tualatin Valley Water District. the Year is Larry Magura. 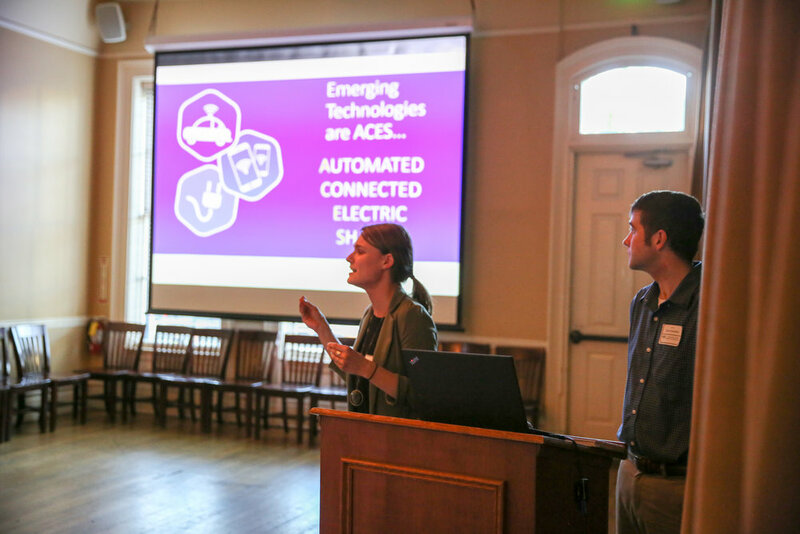 Government Engineer of the Year is Tova Peltz and Young Engineer of the Year is Nick Hatch. 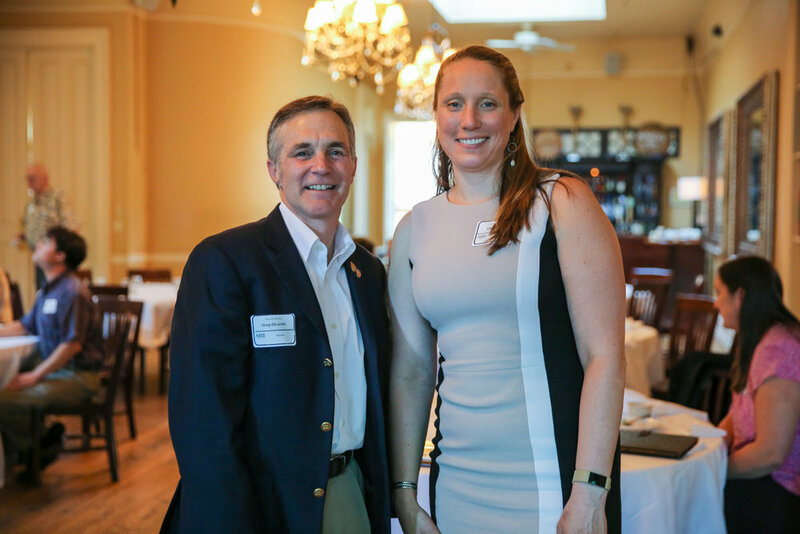 We were honored to have ASCE President-Elect Kristina Swallow join us on this special occasion. Ms. Swallow inducted the new officers. Brand new to the board this year is Jerald Ramsden as Treasurer and Courtney Davis as Oregon Section President-Elect. Members and guests enjoyed a nice dinner in the private setting aboard the boat. 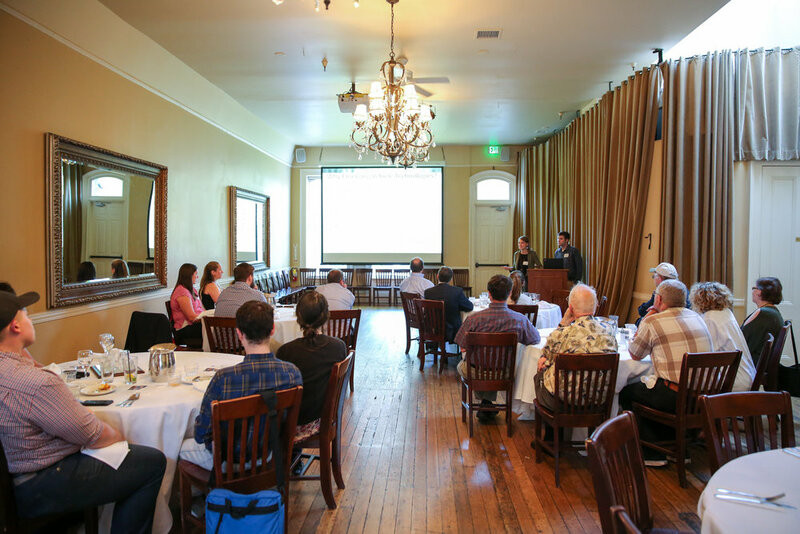 David Sowers of WSDOT provided a special presentation on the high profile and impressive Alaskan Way Viaduct project. Adding to this was the unique ambiance as the boat plied the Willamette River on a perfect September evening and such great company of fellow ASCE devotees accompanied by their significant others.